Back to School season is upon us. I can’t ignore it anymore, not with my blog feed filling up with wonderful posts, or the flyers showing up with the paper. 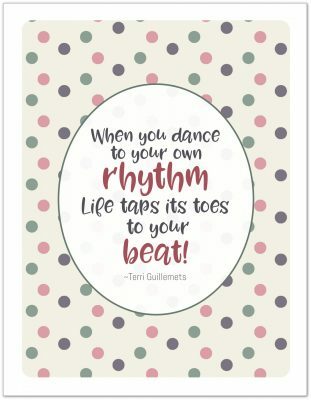 We may still have five weeks left of summer vacations here, but there is a whole lot to do when getting ready for a new school year, and I like to get a jump on things. It seems like every parent I talk to falls into one of two camps, the ‘I can’t wait for school to start’ camp and the ‘I wish summer never had to end’ camp. Personally, this year I fall into the latter. I want these next five weeks to slow right down and take their time. 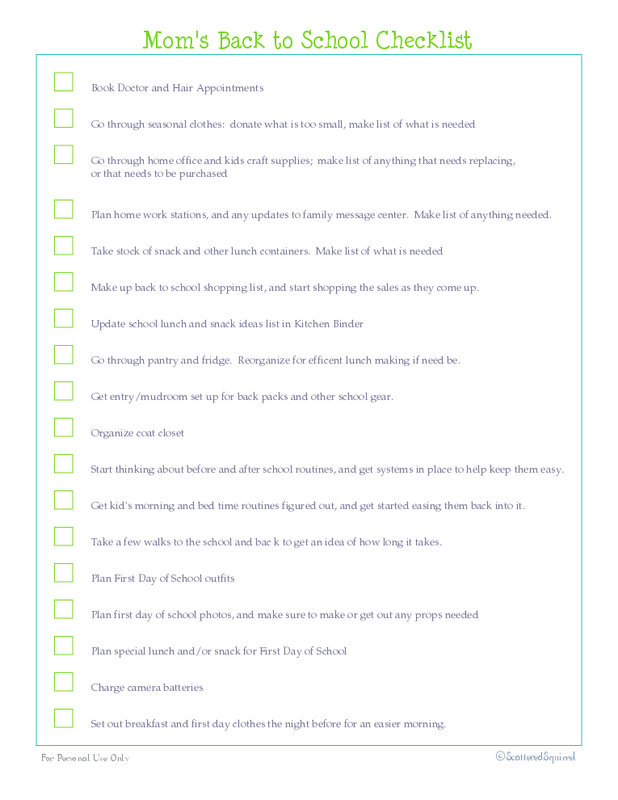 I’m just not ready to even think of a new school year, but I do need to start tackling some of my back to school to-do list before time runs out. Bellow is a list of the things I’ll be tackling in the next couple of weeks. Doctor’s, hair, optometrist and dentist. This is one of those tasks that is best done earlier rather than later. The closer it gets to the first day of school, the harder it is to get in for appointments before the first day. Now is the time to start going through the autumn clothes, donate or pass on anything that is too small, and make a note of what is needed. I also jot down the current size my boys are in, and look for the next size up when shopping. Both our boys seem to wait until closer to Christmas to go through a growth spurt so often times I can hold off on buying too many new clothes before the school year. This lets me shop the sales with purpose, and only buy what it is a really good price. Is there any better time to stock the staples of the home office and kid’s craft cupboard, than back to school season? I make a list of anything we’re running low on, check my wish list of items I need for those areas, and keep my eyes peeled for when they come on sale. Taking some time to make sure homework supplies are set up in one area, and to evaluate and tweak the family message/command center can help get the school year off to a good start. Best of all, when the first batch of homework comes home, you won’t be scrambling to find what you and your child need. It’s also time to start thinking of before and after school routines. I like to have a general idea of how they’re going to look so I can start easing us into them early. About two weeks before the first day of school we start easing back into school year bed times and (waaah) wake up times. I’m going to miss my night owl days when the new school year starts. I also like to take time to go through our Home Management Binder. 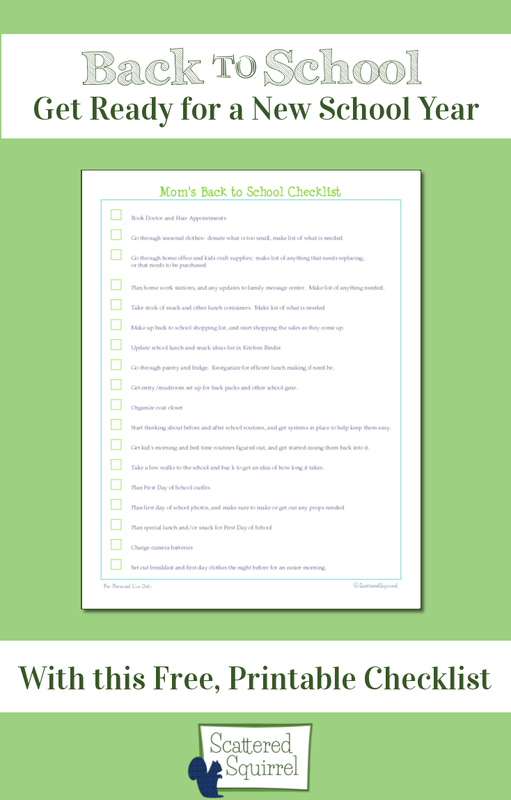 I print out new school forms for each of my boys, and add to our school lunch planner. Now is a great time to start organizing the entry, coat closet and mudroom. We’re going to need room for back packs and jackets, and a place to hold important notices and so on. There is more on my to-do list, but these are my starting points for now. I’m hoping I can slowly check some of these off the lists over the next couple of weeks, so that I can focus on enjoying the last weeks of summer with my boys. It’s alot to remember, that’s why I made a printable checklist so it can do the remembering for me. I know I’ve shared it before, but this way, you don’t have to go hunting for it. You can find more helpful, back to school printables and post on my newly created Back to School page. 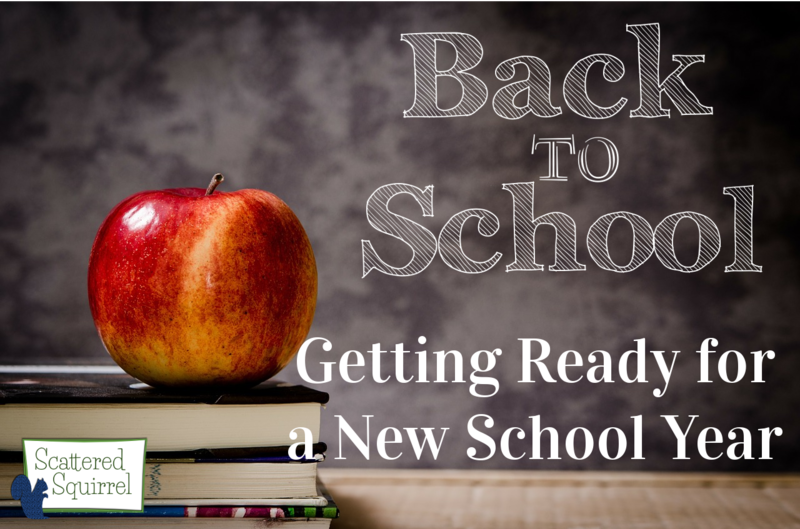 How do you get ready for a new school year?